The smell of death permeated the Imam Zaman mosque in Kabul on Saturday hours after dozens of Shiite worshippers were slaughtered by a suicide bomber during evening prayers. Broken glass and dust covered the red carpet, soaked in the blood of the men, women and children who had been praying on Friday when the attacker blew himself up, causing carnage in the cavernous prayer hall. 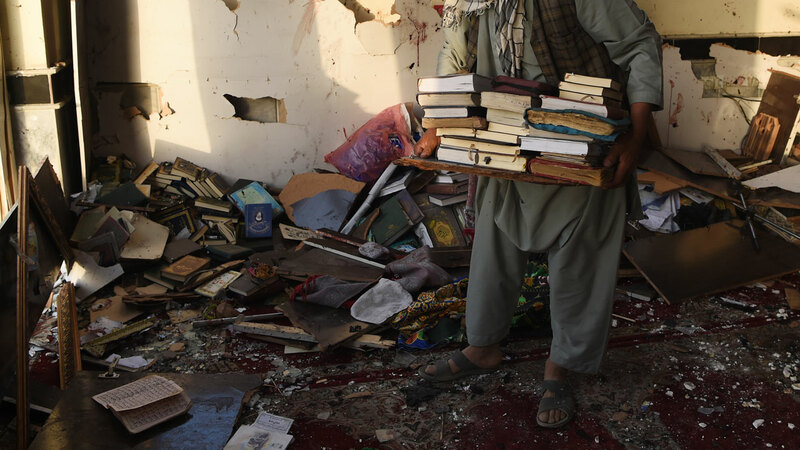 At least 39 people were killed and 45 others wounded in the assault claimed by the Islamic State group — one of two deadly mosque attacks on Friday — capping one of the bloodiest weeks in Afghanistan in recent memory. “The windows of the mosque were broken, and blood and human flesh were spattered everywhere and you could smell blood and human flesh inside the mosque,” Ibrahim, who rushed to the mosque after the blast, told AFP. People expressed anger at the government’s inability to protect its citizens in the Afghan capital, which accounted for nearly 20 percent of the country’s civilian deaths in the first half of the year. “If our government officials cannot protect us they have to resign and let other competent officials take charge,” an eyewitness told AFP. In recent weeks more than 400 civilians were given training and weapons to boost security at Shiite mosques in Kabul, which have been targeted by IS militants, but Ibrahim said women entering the Imam Zaman were not checked. “We believe the bomber had worn a woman’s long veil and sneaked into the mosque and detonated himself among the worshippers,” said Ibrahim, a community leader. Hours after the suicide bomb, the Taliban fired two rockets at the headquarters of NATO’s Resolute Support mission in the heavily fortified diplomatic quarter of Kabul. There were no reports of casualties but the attack came after the militants launched four deadly assaults on police and military bases in recent days. Including Friday’s victims at the two mosque attacks, the death toll for the week stands at more than 180. Early Saturday dozens of anxious relatives, some of them crying, stood outside the mosque’s main gate, which had been cordoned off by heavily armed police, as they waited for news of the whereabouts of their loved ones. An eyewitness told AFP that the attacker detonated his explosive device among the worshippers towards the end of the prayer session. “It was one suicide bomber packed with explosives and hand grenades wrapped around his body,” the man told AFP. The dead and wounded were taken to hospitals around the city but people complained that it had taken emergency services more than an hour to arrive at the scene. Hundreds of sandals littered the entrance to the mosque, left behind by the worshippers killed and wounded in the latest deadly attack on a Shiite mosque by IS, who belong to the rival Sunni branch of Islam. A woman wearing a hijab sobbed as she crouched on the ground searching for the shoes of her brother and young nephews who died in the attack. “I was in the mosque ablution area when I heard a blast. I rushed inside the mosque and saw all the worshippers covered in blood,” Hussain Ali told AFP shortly after the explosion. The force of the blast shattered all the windows of the mosque. Its walls and ceiling were covered with dark blood spatters and peppered with shrapnel. Plastic sandals were caught in the razor wire on top of the perimeter wall after being flung out the windows. Several men moved around the room picking up dozens of coloured prayer beads, Koran holy books as well as chunks of plaster and shards of glass on the floor. “What kind of Muslims are they? What is our government doing?” Rasoul, a shopkeeper in the area, told AFP through sobs.